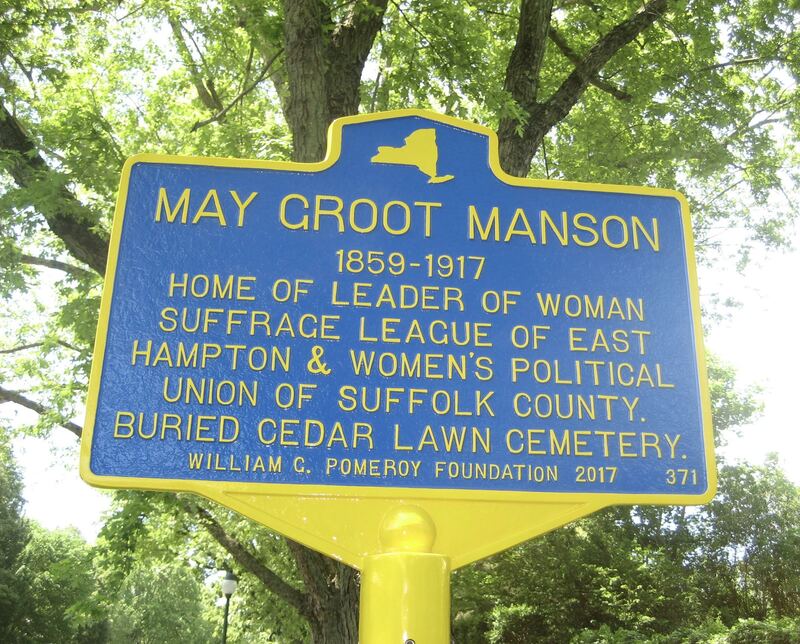 On June 1, 2017, the Village of East Hampton unveiled a new historical marker to honor the most outstanding suffragist on the East End of Long Island, Mae F. Groot Manson, a wife and mother of three. The Mansons were also members in good standing of New York City’s social elite, where she organized literary dances and they supported the ASPCA among other causes. The Village placed the marker in front of “Millfield,” the family’s summer home at 117 Main Street. I got the idea for the marker from HumanitiesNY, which posted notice that the Pomeroy Foundation was sponsor the forging of such markers in New York towns and villages, provided confirmation of the worthiness of the honoree could be documented. 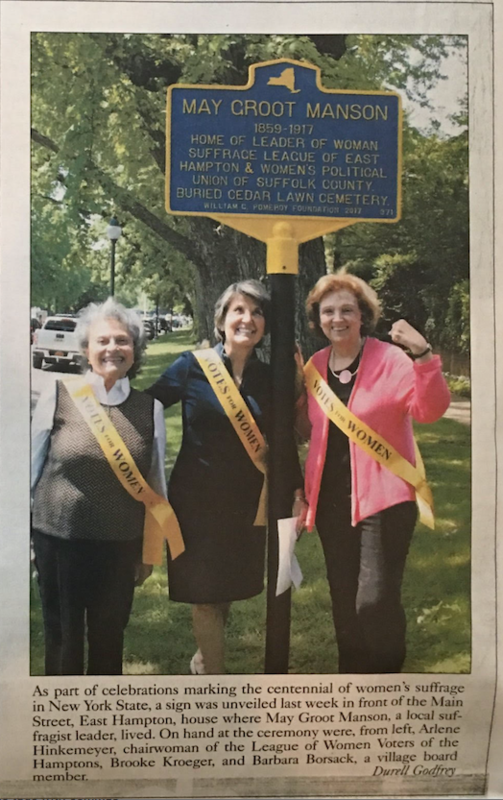 In stepped Arlene Hinkemeyer, a local historian and head of the suffrage centennial commission for the League of Women Voters of the Hamptons. Arlene provided the research. Rebecca Molinaro Hanson of the village office did the rest. Mae died in September 1917, a scant two months before the women of New York State won the vote. Until then, Millfield was the epicenter of women’s suffrage activity on the East End of Long Island. There were weekly meetings, a memorable march to the Village Green which started from the home, a cross-state auto rally in relays that Mae led from Montauk to the western tip of Long Island, from which the suffrage motorists traveled on all the way to Buffalo, carrying aloft a torch. Mae was married to Thomas Lincoln Manson, a banker, stockbroker and consummate “suffrage husband,” one of the group of fine men—thousands of them—secure enough in themselves to turn that pejorative moniker into a badge of distinction. 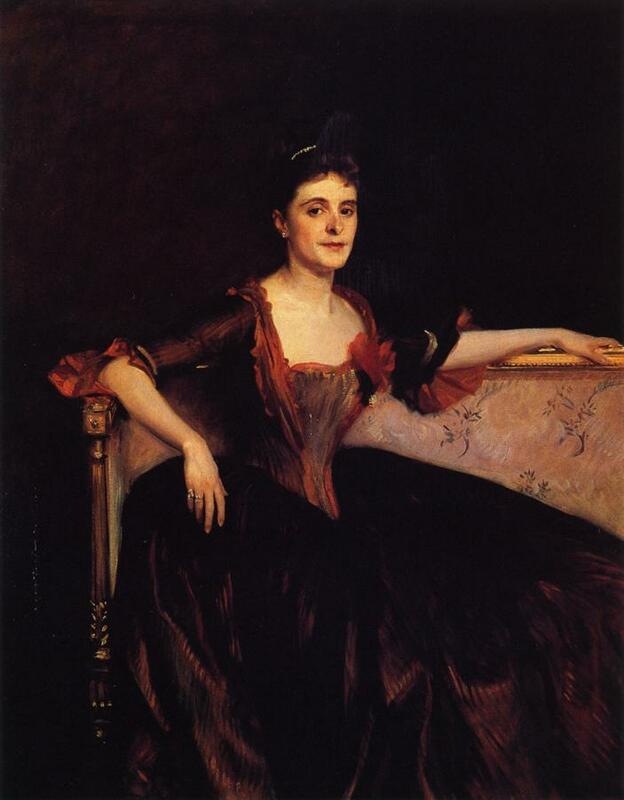 Until now, Mae Manson has been best remembered for the portrait John Singer Sargent painted of her in 1890—as a houseguest gift [!]. She deserves the enhancement of this far more fitting legacy. 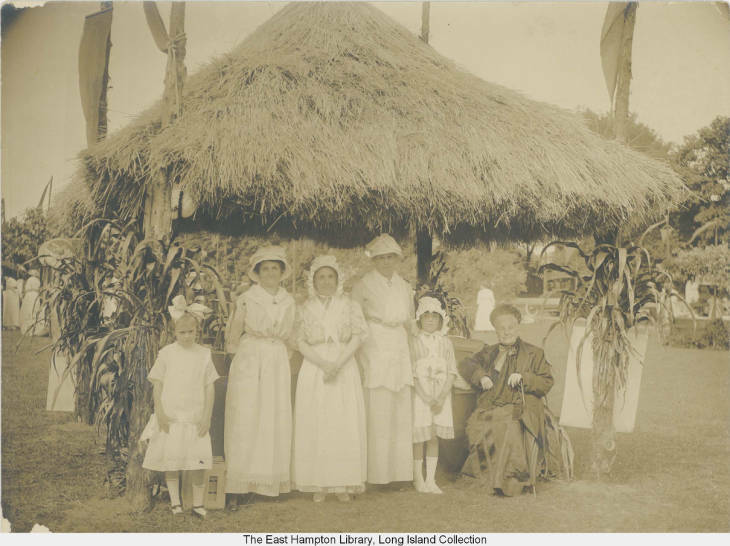 Arlene joins Antonia Petrash, author of Long Island and the Woman Suffrage Movement, and Judith Hope, founder of Eleanor’s Legacy, for a program at the East Hampton Library on October 19th at 6pm in which Mae is sure to feature. I’m proud to be the host of this program, the third annual Tom Twomey Lecture in Local History for the Library’s Tom Twomey Series. 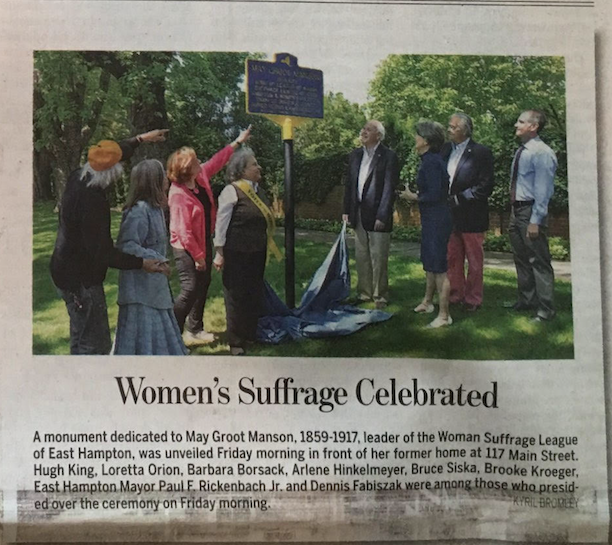 The East Hampton Star (first by Durrell Godfrey) and East Hampton Press (below by Kyril Bromley) commemorated the occasion with these happy faced photos.